With feathers fluffed up against the cold, a cedar waxwing sits in an ornamental fruit tree on Lyman Street where a flock has been feasting on last year's fruit. When it's not so cold out, cedar waxwings have a sleeker look. They have a distinctive crest, a dark eye stripe, and a yellow breast. They sport waxy red wingtips and a yellow band at the tip of the tail. As the days get longer and various birds begin to pass through or return to Westborough, you may notice that the early bird gets . . . the dried fruit. Flocks of cedar waxwings (Bombycilla cedrorum) can be easy to spot when they descend on shrubs or small trees that still bear last year's fruit or berries on their branches. The hungry birds pluck the dried fruit, often stripping the tree or shrub clean as they fuel up for their next flight. These fruits were ignored in the fall when more nutritious berries were plentiful, but they make a welcome feast in the lean times of late winter. Flocks of American robins (Turdus migratorius) also join the feasting, especially when freezing temperatures offer these early birds slim chances of getting a worm. Cedar waxwings and robins sometimes eat at the same time from the same tree or shrub, although the robins are more likely to be taking fruit that has fallen to the ground. Look for cedar waxwings or robins in ornamental fruit trees that have been planted in such places as the parking lot for Gold's Gym (behind Blockbuster) or the Senior Center parking lot. Cedar waxwings also like juniper berries. Cedar waxwings are named, in part, for their fondness for cedars — or more exactly, for the dark blue "berries" (actually cones) of Eastern red cedars (Juniperus virginiana). These trees commonly grow in old fields and along roads and trails. Red cedars are also planted for landscaping near parking lots or as a screen in yards. 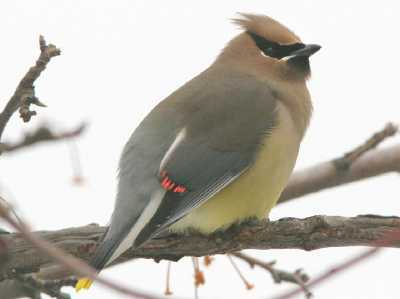 The "waxwing" in the cedar waxwing name comes from the birds' appearance. If you get a good look at cedar waxwings, you'll notice that some of them have red wingtips that look like droplets of wax. The color comes from red pigments in fruit that they eat. Older cedar waxwings have more red wingtip droplets, and larger ones, than younger birds. Some bird experts think that the red droplets may help cedar waxwings advertise to potential mates that they are well fed, healthy, and mature. Cedar waxwings also have a bright yellow band at the tip of their tail, and the yellow comes from yellow pigments in fruit. Some cedar waxwings have tail bands that are orange instead. This different color comes from eating the fruit of non-native honeysuckle shrubs. You'll typically find cedar waxwings in flocks during most of the year. Instead of establishing territories as so many other birds do, they move around in nomadic flocks, searching for patches of wild fruit that's ready to eat. In summer, cedar waxwings also eat insects, often going to places where insects are appearing in large numbers. Surprisingly, cedar waxwings don't sing. They do make sounds — various calls that they use for communication — but they don't perch somewhere and "sing" a pattern of sounds for all the world to hear. Why not? Some bird experts think cedar waxwings don't really need a song. Most songbirds use their songs to establish and defend territories and to attract mates. But cedar waxwings travel around in flocks instead of living in territories, and those flocks already contain potential mates. And when it comes to actually attracting a mate, cedar waxwings have their decorative red wingtip droplets to show off. So who needs to sing? Cedar waxwings have a relatively long nesting season, laying eggs when summer's wild fruits are ripening, between early June and early August. They may nest twice in a season. Pairs often nest near one another, close to fruit or water where insects flourish. When the young hatch, they are tiny — less than an inch long — and naked, blind, and helpless. Fortunately they grow and mature quickly. The parents feed them mostly insects at first and then switch to fruit. Only sixteen days later, the nestlings are covered with feathers and ready to leave the nest, although the parents continue to feed them for several weeks. Cedar waxwings have become more common over the past few decades, especially since the insecticide DDT was banned in the mid-1970s. It's likely that the birds were susceptible to DDT poisoning from eating insects that were affected. In addition, over the years the numbers of fruit-bearing shrubs and trees have increased in the environment as agricultural land has been abandoned and overgrown or developed.